Presenting the Qlippie! A dressable and literally wearable camera! Its Clip-and-go hands free design is made possible with its ultra light weight and small build - and its incredibly easy-to-use! You can use it as a Life Logging Camera to help yourself discover life's daily exciting moments and events! With its Integrated battery you can achieve 2.75 hours of continuous video recording and with its 32GB flash memory you can store up to 12 hours of HD video or 5000 photos. This incredibly small camera packs a heavy punch with its 1080p at60fps Full HD video recording option. 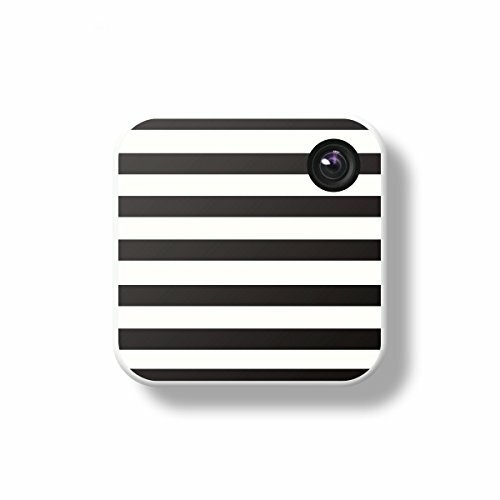 With its 12 different decorative stickers, your camera will match your clothes or your mood every day! Here are some tech specks for you geeks out there: A: 8MP 1/3.2 inch Sony CMOS R image sensor, 122 Degree, F2.6; B: Built-in 32 GB flash memory; C: Picture: JPEG format D: Video: MP4 E: Built-in Stereo Microphone / Speaker; F: Built-in Wi-Fi (IEEE 802.11) Hotspot for App remote control; G: Built-in Lithium Polymer Battery: 1000mAh; 2.75hours Continuous Recording; H: Operating Temp: 0 Degree40 Degree Operating Humidity Weight: 40G; J: Interface: Micro USB 2.0; K: Package Box : APP Functions: Image Filters, Picture& Video Instant Sharing Time-lapse Video, Slow-Motion/Dash Cam functionality. In The Box: Qlippie Camera, 12 unique Dressable Stickers, Micro-USB Charging Cable, User Manual, Warranty Card, Cord, and Mounting Frame! Presenting the Qlippie Super Mini Clip-and-go Camera! An ultra light weight WEARABLE camera!!! Completely Hands free design and incredibly easy-to-use! With its Integrated battery you can achieve 2.75 hours of continuous video recording and with its 32GB flash memory you can store up to 12 hours of HD video or 5000 photos! With its 12 different decorative stickers, you can dress up your camera to match your wardrobe, your mood or your personality! Keep changing it up to keep things exciting! If you have any questions about this product by Qlippie, contact us by completing and submitting the form below. If you are looking for a specif part number, please include it with your message.